As we work on the next version of Fences, we are interested in getting your feedback on what you'd like to see. We are particularly interested in features that will make Fences more useful in your work and enterprise environment. Please comment below with any ideas and suggestions you might have. It would be useful to be able to set Fences to roll down over other windows. Also, it would be nice to be able to set Fences to roll across (left-to-right or right-to-left) across the screen, rather than just up and down. I would enjoy having workspace-icons that would expand to fill the whole screen with a new workspace containing its own fences, and perhaps even further contained workspaces. Mmm "Hierarchical workspace fences"? Is that the right name for such a thing? Generally most people have hoped/expected Fences to be capable of changing Microsoft's GUI Z-order where it pertains to desktop icons. Invariably I have been explaining that is [currently] outside the purview of what Fences actually does. That's been a constant criticism with Fences, along with the issue of being able to lock the placement of icons so they don't rearrange themselves - also an issue due to how they re-order when the Fence is resized/reshaped. for enterprise you could implement some kind of user profiles that are easely distributed? Make Fences compatible with all flavors of Linux. A way to search for files. I wish Fences could have an option to use some of Windowblinds elements as its frames, background, scrollbars and buttons. Please a rollup feature which is OnTop of regular Windows/Application, so that i don't need to minimize all open applications / windows. Please skip online activation for enterprise version. It's a big annoyance and the one suffering is the paying customer. That'd be sweet, great idea basj! I would like the ability to arrange items within a "fence" and have the arrangement "stick." 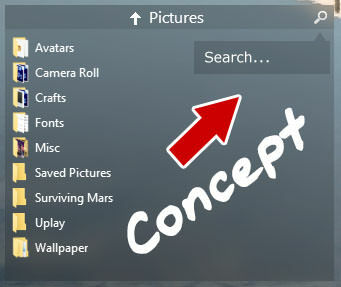 That is the way I arrange my desktop now, and I would like to extend that capability to Fences, so that I could group icons in my favored order and then open and close (hide / reveal) the fenced areas as needed so as to free up more monitor area. Please add search option inside fences not only for Portals but for regular fences too! If you pulling out your secondary monitor, the fences move and get stacked on top of each other on the primary monitor, even if you plug your secondary back in. Would be nice if you can fix this in V4. I use Fences at work on one big monitor set as primary, one small secondary monitor and a laptop screen. The way Fences handles undocking and re-docking is very ugly and messes up the configuration upon re-docking. I have tried all the available options and none work better than this arrangement. Things do not end up the way they started out. Please fix on V4 and the Enterprise development. Please don't make the Enterprise version silly money. Search in Fences can be great! Tabbed Fences is perfect option. Very perfect can be to create Fences as portal for files with multiple columns and rows to see all files without creating any subfolders. Although a relatively minor issue I'd like to see more compatability regarding the Z-order on Windows. My desktop tends to flicker a lot when switching between applications like Wallpaper Engine and Winstep Nexus Dock. At this time Dexpot and Fences do not work together which is a bummer.. I'm using old very simple virtual desktop switcher Desktops. It allows to create up to 4 desktops, but don't allow to close if is created until logoff. But Fences works with. This can be great - but it must support better virtual desktop manager than I'm using. And even that manager needs to support desktops saving also after logoff and reboot. I forgot - for folder portals will be great to allow user align folder name to left/right/center 'cause when I go to subfolder I must always correct pointer location to go other or parent folder. Req'd is also fix MysticThumbs problem with links arrow indicator in Fences, folder portals are ok and links outside Fences too. It would be great , if the restore function of the desktop , would actually work. Every time I update my graphics card driver, I have to manually move all my fences from my main screen, back to my 2nd screen, because the restore function just doesn't work properly. - That you could hover your mouse cursor over a folder and it would open to show you what files are inside. It doesn't actually open the folder but shows you what is in there so that you know you have the right folder. Also, this feature would have to be able to nest so that if you do open that folder and there are other folders in there, they could also be hovered over and show the files in each of them as well.